If you've seen our article on Importing a Docker Hub image into Virtual Labs and had a look around the wonders available in Docker Store, you might be wondering exactly what name you need to give the image when importing it into Virtual Labs. 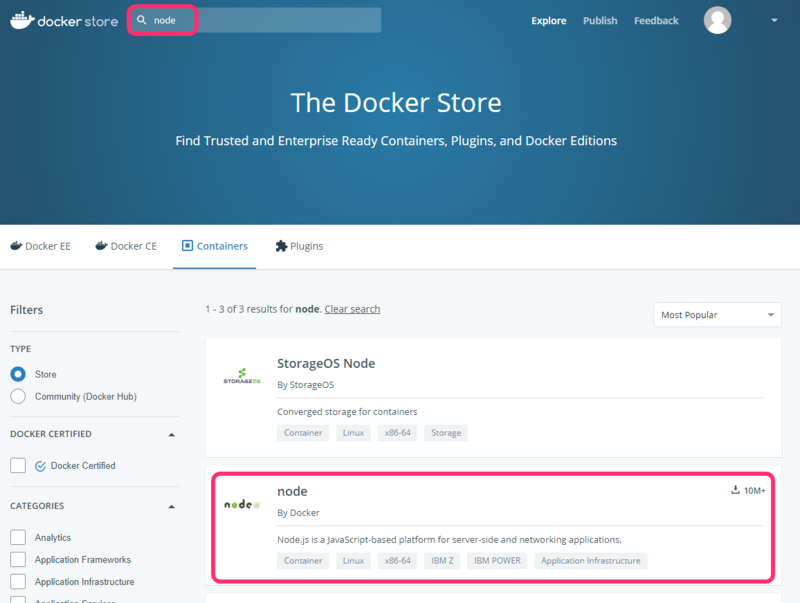 This article may not be up-to-date for long depending on how often Docker Store is updated visually, but hopefully by following these steps you'll still be able to find out how to access the images on their site. Find the image you're looking for on the Docker Store. In this example, we're going to look for Node, so we search the store for it, and enter its image page once located by clicking on it. We can ignore the docker pull part of this command, as that's essentially what Virtual Labs does as its first step to import an image. What we want is the last part of this command, which is the name of the image that we'd need. So in this case when pulling the image into Virtual Labs, the image name we need to use is simply node. Let's look at another example, because Docker Store doesn't always display the command right away. But wait, there's multiple slashes. Virtual Labs doesn't like there to be more than one slash in an image name. This is the case with many of the images that require you to click the Setup Instructions button before displaying the command. In this case, we can just trim off 'store/'. This gives us the image name eclipse/che:5.1.2 which can be used to pull the image in Virtual Labs.